Every December, Anvil Publishing holds a Book Sale. When I heard that you could buy Archie Comic Books for as cheap as P5 (well, I bought mine for P10 each), I really decided to at least check it out. 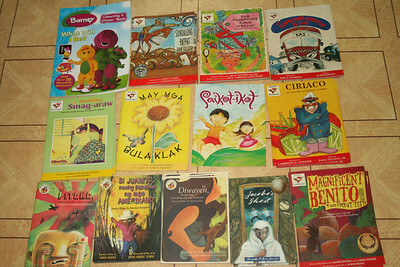 Plus, I wanted to see if they're selling storybooks which I could give away as Christmas gifts. Well, taxis are hard to get these days so we had to commute. I had the brilliantidea of letting my son tag along. But at least there wasn't any major traffic. Most of the books are kinda dusty. Good thing nobody was smoking Rocky Patel cigars there because the dust on the books was already enough to make my son's eyes puff and all of us itch. But the staff was gracious enough to direct us to their washrooms. 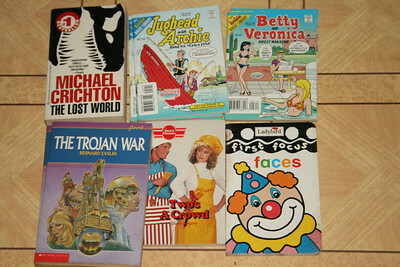 There were a lot of inspirational books, Michael Crichton's The Lost World, old storybooks selling for P10 each, old Archie Comic Books (but only two titles remain). The Kwento ni Lola Basyang storbyooks are being sold at 20% discount but they didn't have a whole set out (plus, we already have a whole set which we bought at 15% off when we attended a parenting seminar before). My splurge buys? Barney coloring and sticker book because it was only half-price off and a new storybook (a brother with autism) that's only 20% off. Those cost me P169. 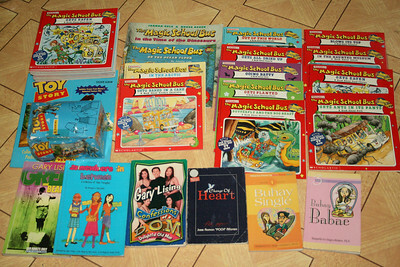 But the rest of the books, I bought for P1,012.00 and am talking of 77 books (including a set of Toy Story stickers and sticker book). 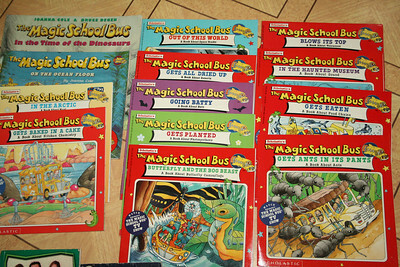 We were already going home when one of the staff mentioned that they're bringing in Magic School Bus books and a mom said that she'd return for them. I was curious so we had merienda and returned for the books. They cost P20/pc but I decided to buy one of each (and some extra to give away). It's silly but I believed them that it's big in the US (plus, the books seemed very informative). I actually bought a lot of storybook extras, because am retaining a copy for our mini library and giving away some to nieces and nephews. While waiting for the Magic School Bus books, Yakee had me read The Mahiwagang Biyulin. I've actually memorized this story and can tell it while also signing half of the words. hala mec! eto na si yakee?!!! paano nangyari yun??? 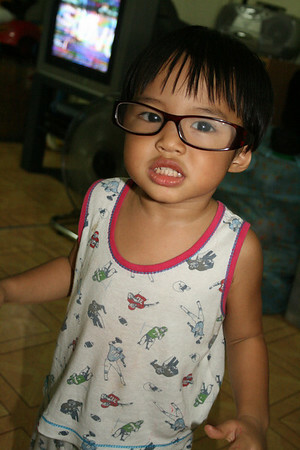 he he bilis nila lumaki no?